The first time I tried kombucha, I made the mistake of sniffing it before I drank it. It had a strong smell of vinegar, so I did not think I would like it. However, the taste was surprising. To explain, it was sweet, tangy and slightly effervescent. I learned that the base is acidic, so a vinegar smell is normal, but not indicative of what the taste will be. Kombucha is a fermented drink made from a base of tea and sugar, using a culture called a SCOBY. SCOBY is an acronym for Symbiotic Colony Of Bacteria and Yeast. It is a mushroom-like culture, which is actually the fruiting body of a fungus. 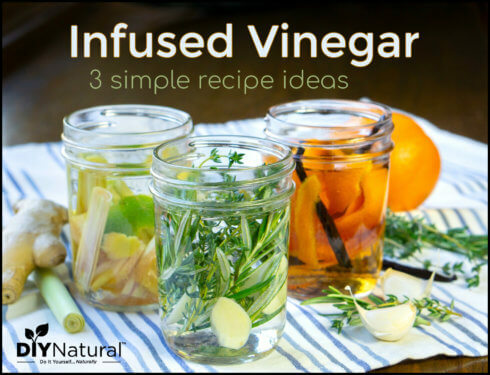 The drink ferments within a few weeks to give you a healthful beverage that is like nothing you’ve ever had before. It is believed that kombucha was discovered in northeast China or Manchuria around 1910. It then made its way to Russia and gained popularity in the ’50s and ’60s. From there, it spread around the globe. Only in the last 20 years or so has it come to be enjoyed here in America. There are several bottling companies that mass produce kombucha, and all of them start with the same process. The starter tea is usually a combination of black and green teas, although many are made from other ingredients, as we’ll show you later in this article. Sugar and a SCOBY are added to start the fermentation process. The SCOBY mother, or original fungus, will float, sink, or turn sideways in the container used. It’s not unusual to see brown stringy things coming from the mother, or it may develop holes, bumps, dark patches or clear spots. All of this is normal. However, if you detect a cheesy, rotten smell, see bugs (such as fruit flies) or see green or black mold, toss it out and start over. The bad SCOBY and liquid can go into a compost pile without harm. The health benefits of kombucha are endless. 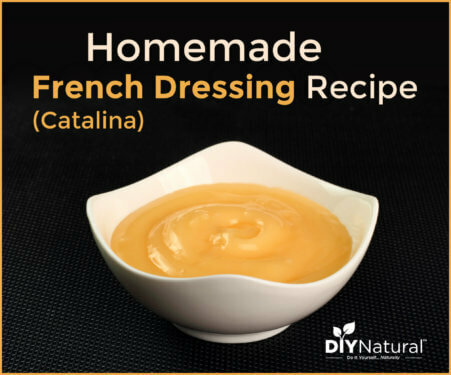 It contains a multitude of probiotics, helping to develop good bacteria in the gut. It also contains enzymes, amino acids, polyphenols, and B vitamins. 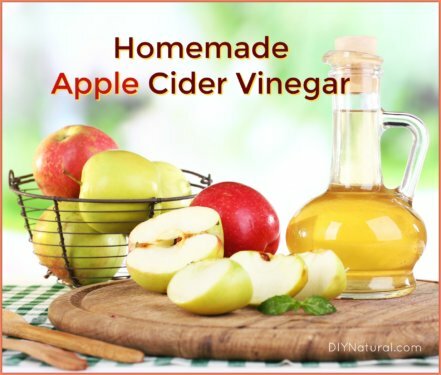 Many say it will cure everything from gout to cancer. While many those kombucha benefits are unsubstantiated, there is no doubt it is good for us. One of the proven kombucha benefits is that it contains glucuronic acid. This aids the liver in detoxification. And while the fermenting sugar can produce alcohol, the amount is usually less than 1%. So how do you make DIY kombucha? It’s very simple. There are many variations on the method, but what follows is my basic recipe. 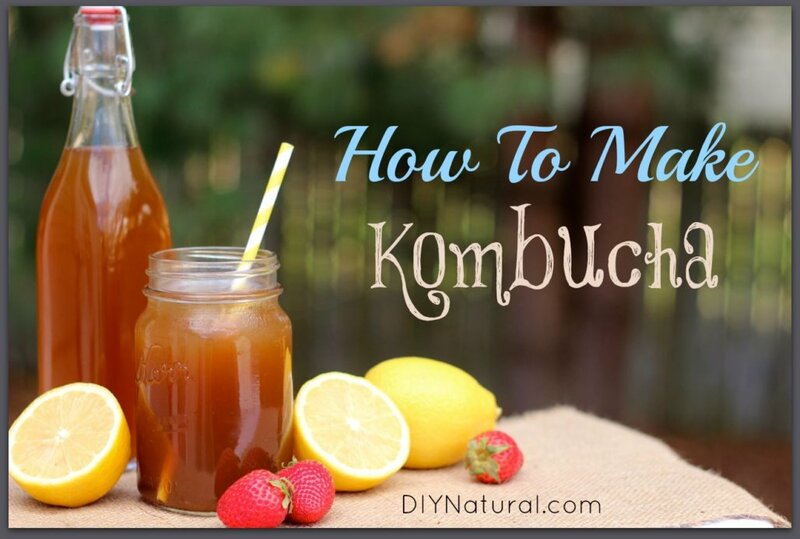 Note: our DIY kombucha recipe is below but you may also be interested in this recipe. Heat the water and add the tea bags. Steep for about 5-10 minutes and remove the bags. Remove from heat. Add the sugar and stir to dissolve. Allow tea to cool. When the sweetened tea is cool, pour into your clean glass jar. Place a tea towel or double layer of paper towel on top and secure tightly with a rubber band. You want it to be able to breathe, but you also need to keep bugs out. Place jar in a relatively warm, dark place where it will not be disturbed. Allow your kombucha recipe to sit for about a week. To test it, slip a straw into the liquid and put your finger over the top. This will hold a small amount in the straw so you can taste it. If it is very sweet, leave it a bit longer. It should be slightly sweet, tangy and slightly effervescent. If it tastes off at all, start over. It could take two weeks depending on fermenting conditions, but shouldn't be much more. If you're having trouble with your kombucha recipe fermenting, find ideas for troubleshooting here or here. Once the taste is to your liking, you can remove the SCOBY and ½ - 1 cup of the kombucha. Set this aside and use to start another batch of kombucha. Bottle and refrigerate the rest of your kombucha. Now, what can you do to change things up? I’ve tried many things with my DIY kombucha recipe, and not all were successful. You can substitute sugars, although sugars with molasses in them (unrefined) are hard for a SCOBY to digest. This is one-time using white sugar is okay – after all, it’s just food for the yeast to feed on. Pasteurized (not raw) honey can also be used, but I have not tried this one. Let me know if you do! Don’t use stevia, lactose, xylitol or other non-caloric sweeteners. The sugars are necessary for the fermentation process. I have also tried black and green tea, hibiscus flowers (Roselle, sometimes sold as “Jamaica” in stores), fresh ginger and turbinado sugar. It was just about the best thing I’ve ever had. The fresh ginger is the kicker. Try other fruit juices such as carrot, mango or grape, and also fresh fruits like strawberries and lemon. I’ve also had one made from coconut water and lime. The possibilities are endless. You can make DIY kombucha from almost anything. What are some of your favorites? how long can you keep a batch of kombucha in the refrigerator in a sealed bottle? I wouldn’t recommend using paper towels to cover the top of the jar. Tee shirt material is really good. The danger of paper towels is loose particles from the paper getting into the kombucha and causing problems. This is something I have read over and over from really experienced kombucha makers. 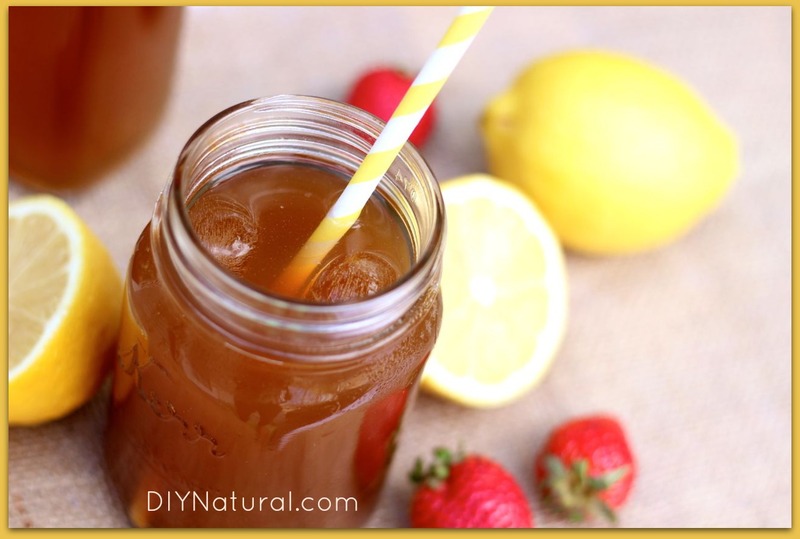 This is a great post and I’ve been wanting to try making my own Kombucha, but have been put off by the amount of sugar in it, as I’m keeping away from sweet drinks. To my mind, it’s a little contradictory that a drink with so much added, refined sugar can have such health benefits – especially when something like cancer feeds on sugar. What are your thoughts on this? My husband drinks Kombucha twice a day with half a lemon squeezed in each glass. I only use 4 green tea bags for each gallon because he doesn’t like it so strong. I can’t drink it on a regular basis because of constipation. I’m highly sensitive to caffeine and eliminated it from my diet over 20 years ago. Does the caffeine in the black tea carry through to the finished beverage? Yes I don’t drink kombucha too late in the day due to the caffeine from the tea. Another way of aquiring a SCOBY is to purchse a storebought kombucha drink, open it and let is sit out for a week or so(covered with a cloth). A SCOBY will grow from the sediment in it. Thanks Matt! I know you can use starter blend from storebought kombucha, but I didn’t know you could grow a SCOBY from it too! I’m going to have to try it. In Russia we call it KVAS 🙂 I do not remember the vinegar smell. It is a very common drink esp in summer. However, commercial KVAS has WAY too much sugar in it, somethink like you would have in your commercial pop or cola. Therefore we make our own. Hi Elena, I don’t use as much sugar as commercial blends either. That’s the good thing about making your own. You can adjust it to your own tastes. actually in Russia it is called CHAYNY GRIB (Tea Fungus). Kvas is completely different drink made out of rye bread, but pretty similar in taste to kombucha. What kind of black tea and green tea do you use. Is it organic? Have you ever tried using loose leaf tea? And if so, how much did you use as compared to the number of tea bags? Amy, I use a combination of loose leaf Oolong tea and green tea, both organic. 1 tablespoon of loose tea equals about 4 regular size teabags. The Oolong has a nice, slight smokey flavor. Hope that helps. Thanks Kat. I’ve never used loose tea, though I imagine it would be about the same as bagged. It’s probably much cheaper. This is a great post! I have enjoyed tinkering around with kombucha for the past year, but I haven’t been as creative as you with my add-ins. One question though-I have read that you should save any add-ins like herbs or juices until the second fermentation so that they do not harm the scoby. Is this what you are doing when you add all your add-ins? Or are you adding them during the initial fermentation? Hi Christy! I had never heard of fruit juices harming the SCOBY, but it makes sense. Since I hadn’t heard it before i started, I put them in the first fermentation. I’ve never had a problem with a SCOBY until I had used it several times and it seemed “worn out”. I cut it into pieces then and give it to my chickens. They love it, but the dogs aren’t as excited. So, yes, I always add anything I’m using to the first fermentation.